What a day of progress! Cam came over in the morning and we got to work on getting benchwork built for the lower deck. But before we did that, I wanted to get that chopsaw stand that Murray brought over on the 21st into action. Turns out that shelf I was going to use (the top off the table my brother made eons ago) was the perfect size for the base of the chopsaw, and shortly after, the chopsaw was secured using bits of ready-rod, spare nuts and washers from the now-complete helix construction, and we can finally use it as intended. 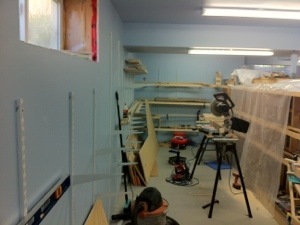 I even have the ability to do much of the work solo now that I don’t have to have someone hold up a long piece of wood. Once done, we got to work on the lower deck benchwork, as well as the middle deck too, in some respects given that the deck depths were going to be the same. 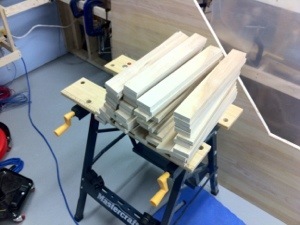 Stop blocks were installed on the saw and we chopped up a lot of the 2″ wide strips into dozens of fingers. Holes were drilled through all of them for bus and accessory wires and voila. Half the job done…well, not quite. Lots of other things needed doing, like drilling holes through the shelf brackets for securing the wood to the metal brackets, cutting the pieces to good lengths, splicing them together, and then getting the works secured to the shelf brackets and to the wall at the south end. That chewed up a very good portion of the day and then we started mocking up how the rest of the decks would play out, and it turns out, quite well…Well, almost. I was hoping we could simply screw from underneath the brackets into the 3/4″ plywood for the upper deck, but initial appearances showed that many of the brackets were pretty far from level, and no idea why. We’ll investigate later as to potential solutions. This entry was posted on August 7, 2012. It was filed under Benchwork.